Astronomers have spotted the first new asteroid of 2014 — a car-size space rock that apparently slammed harmlessly into Earth's atmosphere just after the New Year began. Scientists with the Catalina Sky Survey in Tucson, Ariz., discovered the asteroid, known as 2014 AA, early Wednesday (Jan. 1), NASA officials said. Orbit projections suggest that the space rock likely entered Earth's atmosphere sometime between Wednesday afternoon and Thursday morning (Jan. 2). "The most likely impact location of the object was just off the coast of West Africa at about 6 p.m. PST (9 p.m. EST) Jan. 1," NASA officials wrote in a press release Thursday. Because it was so small — just 7 to 10 feet (2 to 3 meters) across or so — asteroid 2014 AA probably broke up during atmospheric entry, just as the similarly-sized space rock 2008 TC3 did over northern Sudan in October 2008. 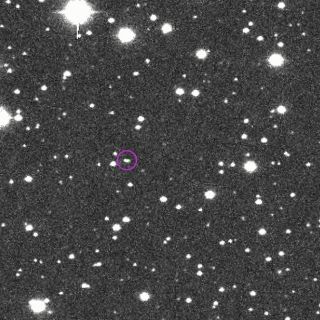 "Asteroid 2008 TC3 is the only other example of an object discovered just prior to hitting Earth," NASA officials wrote. "So far, there have been a few weak signals collected from infrasound stations in that region of the world that are being analyzed to see if they could be correlated to the atmospheric entry of 2014 AA." Scientists have discovered more than 10,000 near-Earth asteroids such as 2014 AA to date. However, they've only just scratched the surface of the total population of these space rocks, which is thought to number in the millions. And some of them are big enough to cause extensive damage should they slam into our planet. In February 2013, for example, a previously unknown space rock roughly 62 feet (19 m) wide exploded above Chelyabinsk, Russia, injuring more than 1,200 people. The Russian meteor explosion occurred on the same day that a 100-foot-wide (30 m) asteroid, known as 2012 DA14, missed Earth by just 17,200 miles (27,700 kilometers), coming closer than many of the communications satellites that circle our planet.